Colts capture early momentum! And by that, I mean the exact opposite. In the first quarter, the Colts looked absolutely awful, with collapses on offense, defense, and special teams. Offensively, they began with three three-and-outs. On their third punt of the game, the Seattle Seahawks got through and blocked the kick. The officials ruled the recovery a safety, saying the Seahawks never had possession of the ball. That ruling was upheld on review. The Colts found themselves in a quick 12-0 hole that could've easily been a 17-0 one. Defensively, Marshawn Lynch ate up the Colts, taking his very first carry for 24 yards. Just when I thought you couldn't possibly be any dumber, you go and do something like this... and totally redeem yourself! As quickly as the game seemed to get away from the Colts, they got right back into it. Andrew Luck hit T.Y. Hilton for a 73-yard TD pass that cut the deficit to 12-7. On the very next drive, the Seahawks had to settle for a field goal. Lawrence Guy got a big mitt up to block it; Delano Howell scooped it up and took it the distance. Just like that--and in the face of all logic and statistics--the Colts had a 14-12 lead. And then the 'Hawks came right back. Just when you thought the Colts were taking control of the game, Russell Wilson led Seattle on a 12 play, 82 yard drive that culminated in a touchdown pass to Jermaine "Don't Call Me Jevon" Kearse. Seattle took a 19-14 lead. The key play was a 4th and 3 near midfield in which Wilson escaped pressure and scrambled for a first down to keep the drive alive. And then the Colts came right back. Luck led Indy on an 11 play, 54 yard drive that ended with a field goal. The score was 19-17 as halftime neared. The key play involved Luck somehow escaping pressure, spinning, and throwing a pass to T.Y. Hilton on third down to keep the drive alive. 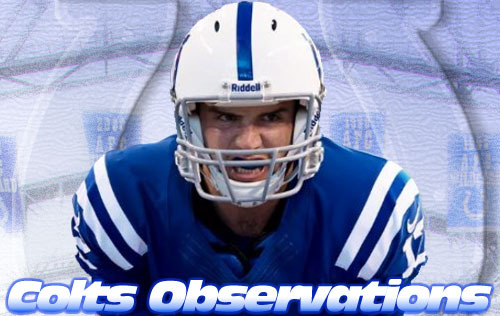 This drive also included a crucial pass interference penalty on 3rd and 22 as well as a holding penalty on Anthony Castonzo that nullified a good scramble by Luck. (Shotgun) R.Wilson sacked at IND 48 for -7 yards (R.Mathis). FUMBLES (R.Mathis), RECOVERED by IND-E.Walden at IND 46. E.Walden to SEA 44 for 10 yards (M.Lynch). FUMBLES (M.Lynch), RECOVERED by SEA-R.Wilson at SEA 30. R.Wilson to SEA 30 for no gain (L.Guy). Credit minus five sack yards for Robert Mathis on the play. So basically, Mathis got credit for a sack-and-strip, Walden recovered Wilson's fumble before fumbling on the return after being hit by Marshawn Lynch. Wilson recovered Walden's fumble. Had there been more time on the clock, it would've been a first down for Seattle due to the change of possession, but time ran out for the half. Everybody got that? All you need to know is that Robert Mathis got his 100th sack (he'd add another one later). Second half defense. The Colts weren't perfect in the second half, but they played big when it counted. Here's the rundown of Seattle's second half possessions: field goal, field goal, field goal, punt, interception. Yes, Lynch and Wilson got their yards, but they didn't get touchdowns. Even when Luck got sacked in the third quarter and fumbled to give up excellent field position, the Colts held Seattle to a field goal. This was key: the Colts gave up big plays, but they didn't give up touchdowns. Offensive production. After fumbling away their first possession of the second half, the Colts scored two touchdowns and a field goal (their last possession consisted of kneel downs). Those throws. Oh, those throws. Both long passes to T.Y. Hilton were things of beauty. The first one involved a coverage breakdown on the part of the Seahawks, but Luck read it and dropped a perfect pass in there for Hilton. The second Luck-Hilton hookup was even prettier; Luck put the ball over a defensive back and in a place only Hilton could catch it. T.Y. "Call Me TD" Hilton. Five catches, 140 yards, two touchdowns. Hilton was lightning in a bottle, and after a couple relatively quiet weeks from him, it was great to see. The Ageless One. Reggie Wayne caught six passes for 65 yards. On the go-ahead TD drive, No. 87 caught a pass for a first down (this was reviewed after a terrible spot) and then had another reception for 19 yards (somehow he and Darrius Heyward-Bey ended up in the exact same spot, but Reggie came down with the catch). Another Reggie Wayne grab didn't figure into the stats--his brilliant reach-behind reception on the two-point conversion was key. Wild Wilson. The Colts...um...kind of contained Russell Wilson? (shrugs) He ran 13 times for 102 yards and no touchdowns. He was 15-31 for 210 yards, two touchdowns, and a late interception. This guy is phenomenal; nearly impossible to sack and an accurate thrower. When it looked like the Colts would get to him, he'd usually sashay out of a tackle and run for positive yards. I haven't gotten to see a ton of Wilson other than highlights, but I can see why he's so highly touted. Great player. He did make a few inaccurate throws, but that was more of a result of pressure by the Colts than anything. Great job, CFL. Great job. A key play in this game came on a third and two. After Marshawn Lynch ran for two yards, Wilson found Golden Tate for six yards. On third down, Wilson tried to run around the left side, but Jerrell Freeman made a brilliant open field tackle to stop the drive and force a punt. To me, this was the key defensive play of the game. Who knows what happens if Wilson shakes the tackle (as he did so many times) and keeps the drive alive? Freeman, by the way, had a monster game with 13 tackles. He got burned a couple times by Wilson, but I'm pretty sure everyone missed a tackle on him. Richardson. We've been patient, but it's still hard to gauge this Richardson trade. You don't trade a first-round pick for a guy who plods ahead for one or two yards a carry. Given Ahmad Bradshaw's status, though, it's a good thing Indy made the trade. I just want to see more production from Richardson, more "chunk" runs in the second half. I will say this, though: rewatch the Luck-Hilton TD for 73 yards; Richardson made a big-time block to give Luck enough time to launch the ball. So perhaps his value isn't measured entirely in yards per carry. Another example: on 3rd and 5, Richardson broke tackles for a 10-yard gain and a first down while the Colts tried to chew some clock. Donald Brown seems to be the Colts' most effective back, but I think that's because the Colts pick their spots with Brown. Darius Butler, closer. Darius Butler batted away a pass on the Seahawks' last drive. A few plays later, he stepped in front of a pass intended for Sidney Rice and intercepted it to seal the win (Wilson also got rocked on the play right after he released the ball). Pink flags. I think we all appreciate the NFL's "A Crucial Catch" campaign, but let's give the refs their yellow flags back. The pink ones are seriously hard to see (or, as an alternative suggestion, make them extremely neon pink so they're easier to see and distinct from the players' towels and wristbands). A spirited throw. I love how Chuck Pagano launched his challenge flag onto the field after the officials gave Reggie Wayne a terrible spot on a third down catch. I mean, Pagano really chucked it out there. I found it amusing. A little help. Hey, you can't win games without a little help. The Seahawks had a couple killer pass interference penalties, including an offensive PI call that I still never completely understood (yes, it was a little pushoff, but I didn't think it warranted a flag). You can outrun the holder! Delano Howell is fortunate he made a move to avoid Seattle's holder, who trailed him on the blocked field goal and nearly tackled him. Howell sidestepped him and managed to get into the endzone. I still think his teammates will rib him during the film session. Because you have a lot to beat your chest about. Sergio Brown got flagged for taunting on a kickoff return in which the returner took a knee and the touchback. Since Brown neither kicked the ball nor tackled the guy, I have no idea what he could've possibly been taunting him about. Twitter reaction: #smh. Hey, Seattle, you only get three timeouts per half. A little thing that hurt Seattle was its quick employment of timeouts in the second half. They took their third and final timeout with 8:55 left in the game when the Colts lined up for a two-point conversion. Seattle's personnel didn't match the Colts' personnel. And with that knee, David Reed gives the #Colts their best field position of the game. It's been that kind of day so far. And I always want to call him Russell Watson. I know who Russell Wilson is; I watched him play at Wisconsin. Yet, I can't tell you how many times I typed "Watson" by mistake in my game notes.